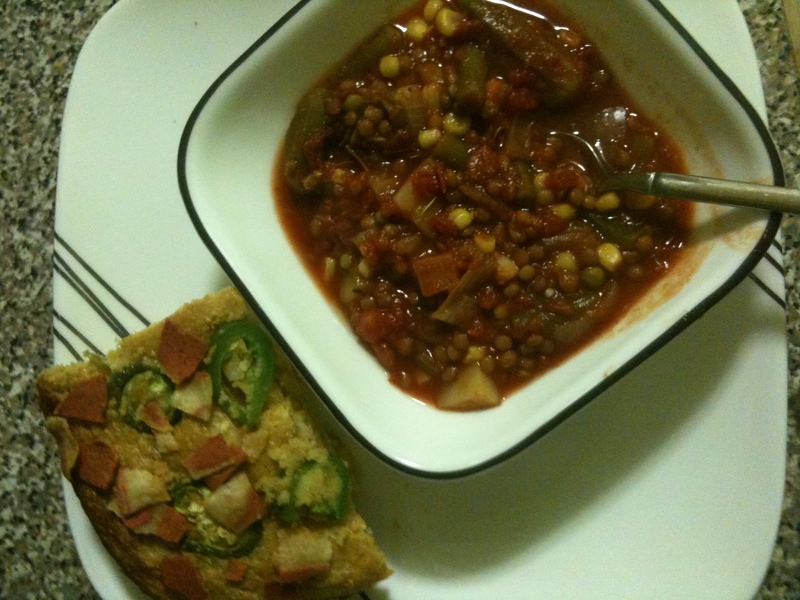 How to’s of healthy crepes + homemade vegetable soup & mexican cornbread! NOTE: You can sift the flour to help avoid lumps. I would recommend this for heavier flours. Usually rice & pastry flours smooth out pretty well. First, place you flour & salt in a bowl and mix in your 2 eggs. Then heat your butter and add to the mixture. Then slowly add your liquids. This will be runny! You should get 5-10 crepes out of this depending on how big you make them. Now decide with what you would like to fill them. (This is part of what can make them healthy or not! For breakfast, I like to take plain Greek yogurt and mix with honey or agave nectar and then add fruit. If it is summer, then I love fresh fruit like blueberries, strawberries or raspberries, but if it’s winter, then go with organic frozen ones and let them thaw while you’re cooking. If you want, you could go higher calorie with fresh whipped cream, Nutella, banana and peanut butter, or even go savory with egg and cheese etc. Endless possibilities! Now, heat a good small or medium sized skillet and put in a Tbsp of olive oil. Also get a good spatula–I like the silicone ones. Roll the oil around when it gets warm to get a good coating on the pan. Pour in a little blob of batter, pick up the pan and roll it around–keeping it circular–until super thin then replace on burner, give it a minute or two and flip & cook for another minute, then remove and start the second one with another batter blob. DON’T WORRY IF THE FIRST ONE FALLS APART OR IS TOO OILY! Sometimes it takes 1-3 crepe catastrophes before they start working for you. I still eat mine, but they generally look horrible or fall apart. I will usually add just a little more oil to the pan about half way through, if needed. Now, please enjoy my little “how to” video and then, your own homemade crepes! 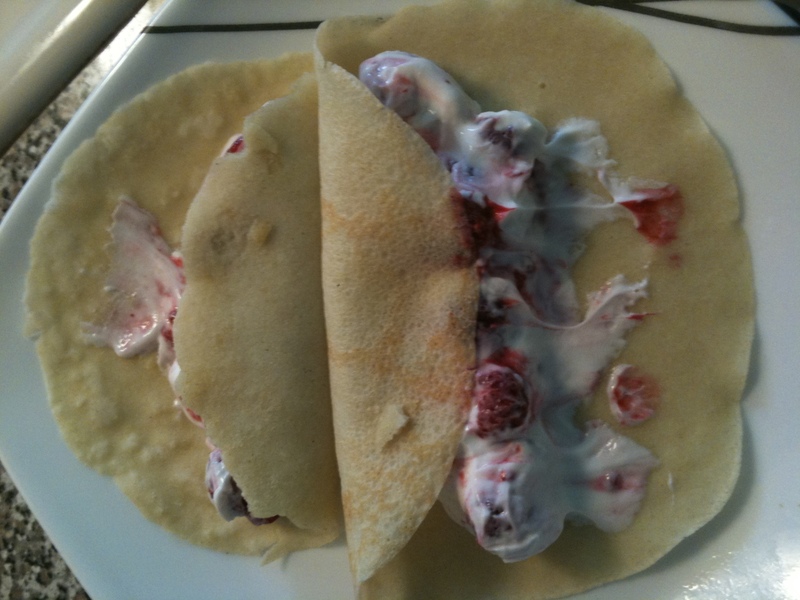 These are the crepes I made filled with Greek yogurt, honey and frozen raspberries. Next, fold them over to meet at the top (like an enchilada) and use a little yogurt or honey to stick closed. Then dust with powdered sugar if desired! And now, as many of you may be experiencing, it is winter. And nothing warms you up after a cold day out like vegetable soup and Mexican cornbread. This is a deliciously easy dish you can put in the crockpot and let it simmer all day long but you can also cook on the stove top. NOTE: You don’t necessarily have to cook things like beans, lentils, potatoes, or pasta before adding them to the pot, just make sure that you have enough added water and time for them to get fully cooked. Frozen green beans, peas, corn and okra. If you want more heat, add a chopped jalapeno, but no pressure because you can make the cornbread pretty spicy too. Then add ample cans of crushed tomatoes–I used to large cans this time. If you can find the kind that are “herbed” or “spiced” then buy those and that will already be done for you. If not feel free to add any spices you like/have on hand, ie. basil, rosemary, thyme, etc or just an easy dried Italian spices combo. And of course, sea salt and pepper to taste. Then, put that baby on low and let it cook all day long! It’s not rocket science, so just experiment. You could do it on high for 4 hrs or low 6-8hrs etc. If you are home you can take a look and make sure you are good on water and give it a stir. Later in the day, it’s time to make the cornbread. (Get excited). This makes a pretty large pan so it’s great for families or to share or to eat for several days all by yourself! Jalapenos — If you want this to be mild, then omit or nicely slice and lay over the top of batter once it’s in the pan. Or for more, either chop several fresh ones and mix in or try adding a small can of pickled jalapenos. Cook in the oven about 1 hour on 350 degrees F. Half way through the baking, crisp up a few strips of Morning Star Veggie Bacon Strips in your toaster oven or regular oven on the other rack and then crush them over the top of the cornbread. It’s finished when you do the toothpick test and your toothpick comes out clean! RANDOM BUT IMPORTANT TIPS: Be careful when buying frozen corn! Read the ingredients. There should only be 1: CORN, but many have multiple ones like SUGAR or other colorings/preservatives. Avoid already grated cheese! Many chemicals are used to get cheese to stay like that and to not stick together and to last a really long time. Ewww. I realize it is convenient, but, honestly, cheese is not all that healthy and we really don’t need it to be convenient. In fact, it is much better if it is inconvenient, because then it won’t be something we grab as an easy snack all the time. Work for that cheese! You’ll burn off some of the calories you’re about to consume as you grate! I hope you’ll try some of these healthy recipes and let me know if you have any suggestions! And remember, no animals were harmed in the making of these meals.